Oh dear Dtoid, seems I slipped up a bit and forgot you wonderful people. Either way I still have a challenge to be updating, so better late then never, yes? I'm still working hard on it and only have 25 more games to go as I write this. But for now here are games 22, 23, and 24. After playing both Mega Man X2 and X3, I honestly though this series in the Mega Man franchise didn�t deserve to continue. A lot of the past two games just felt like it was trying to make lighting strike twice, which of course didn�t happen. Mega Man X4 however truly felt like a good game that could stand on its own merit, and dare I say I actually like it more than the original. I�ll let it be known that I�m just not a fan of this series, but MMX4 just did something for me that turned my head in awe. While I don�t think it can be argued that X4 beats X in terms of level design, X4 gave me the option to play as Zero and frankly that�s what hands it its victory. There is just something about Zero and the way he plays that truly makes this game what it is, and in comparison, playing as Mega Man X is just boring. Just the way Zero is all about risk and reward makes the game so much more fun and makes this game different enough to separate from the original series. Mega Man X just feels like an even more beaten up song and dance routine, he's always underpowered in the beginning, gets stronger and eventually destroys everything in his path. X just hits too many of the same buttons for me to say that its different from the original series, because each time I play as X I just wish I was playing his original counter part. On top of that, there is a constant need to charge his blaster to take down enemies, that I just get really annoyed and is inconvenient at times, it doesn't make the game challenging, just tedious. Now Zero on the other hand, doesn�t get to be all powerful like X, aside from a few power ups, Zero plays the same beginning to end. So what it really comes down to is recognizing patterns and learning when to attack and when to dodge. Zero isn�t helpless though and the fact he tears through everything with a simple slice makes all the difference. Really Zero is what I wanted from the X series, different yet familiar gameplay, and he delivered it. So why didn�t they just focus on him after X4? So much wasted potential. Conclusion: Perhaps the greatest reason why this game is so great is because you can play as Zero. He mixes the game play style enough to make X4 feel fresh and enjoyable. Otherwise I think this game would have been far more criticized over level design and the gimmicks in certain stages if it was just Mega Man X.
I honestly didn�t know what to exactly expect from Uprising. And yes I saw the trailers, yes I was aware of how the game played back in the 80�s, but I don�t think anything really prepared me for what I got. At first glance, Uprising just seemed like another game with some bad jokes here and there, you know campy humor, but as I played through the game I generally laughed out loud numerous times and was just having so much fun with it. There was just so much to this game that it just overwhelmed me with joy. I fell in love with Uprising and its wonderful twisted characters, constant breaking of the 4th wall jokes, and general awesome and challenging gameplay. I can safely say that it was one of the few times in my life that I felt like a kid again. I was enjoying myself so much and loving every bit of the story that I just wanted to keep pressing forward, and play till the end. Then I beat it, and while I can�t say it got dull after that, I can say I wanted more of whatever what was just served to me. I can�t really remember how much fun I had with the whole cast of characters, and certainly couldn�t tell you the last time I heard a cast of voice actors that good. But never the less the game that I knew and loved had ended, but only to arise was a different game in multiplayer. Ill be frank, I�m not one for the whole multiplayer stuff in any kind of game, but for once in my life I was hooked on it. There were just so many things to do for multiplayer, and it was all worth it because of how incredibly balanced Light vs. Dark was. I found myself spending hours on end just figuring out which weapon was best for me, and then fusing an even better weapon to gain an upper hand on the field. Or placing different modifiers on it or figuring out which weapons would make a better weapon and the risks and costs of making said weapon. And for a moment there, I forgot about my 60 game year challenge and just played Uprising constantly. Heck it didn�t even end there as I went out to a couple of the meet ups at Gamestop to get some of the Kid Icarus cards and play a few local battles. As well the soundtrack always kept me pumped and listening to it never got dull. Really the game offered so much to me and the only thing that was ever wrong with it was the horrible land controls. But changing land controls to a button lay out simply made the problem nonexistent.Uprising is the best kind of game a system can hope for and certainly is the best game on the 3DS to this date. Heck I'm still playing it to unlock all the achievements it has and looking forward to the next set of cards Nintendo has in store for us! Conclusion: Uprising has everything you could ever want in a game, charming characters, wonderful jokes, some drama, great gameplay, multiplayer, fusion systems, achievements, amazing soundtrack and even a bloody card game. With only bad controls going into the pile of, �what uprising needs to fix� I�d say it�s a win win of a game! This game took a while to get, and frankly I didn�t know I would be playing it by this time this year, but here we are. And its not the matter that I thought Black and White sucked or weren�t as good as the last generations, in fact after playing them, I have to say B/W is certainly the best constructed Pokemon games to date. No, the fact I didn�t get B/W was because a lack of full interest and that the games hardly ever go on sale or lower in price. Without something to push me to buy it, I didn�t feel the need to buy it, but when I picked up Kid Icarus: Uprising, I had enough left over to get Pokemon Black for far less than I expected so I figure, �just go for it!�. Playing through Black I have to say it really cracked down on battles being �easy�. This is certainly a hard game for Pokemon standards, and I loved the challenge to it, the AI is at least smarter, and there are hardly any trainers that can just be taken out easily, you really have to pay attention to your battles, especially post game. I also have to say that the new battle system is amazing and makes the Pokemon stand out a lot more and gives a lot more feel for the Pokemon universe. Also love the fact there is a lot more to explore post game, TMs are infinite, and HMs aren�t used nearly as much. And really it's just that Pokemon Black does a lot of little things that just make everything else so much better, and it has been a long time coming for the Pokemon series to fix these things. You really don�t see how stale a series you love is till they make a far better sequel to give light on how crappy the past games were. 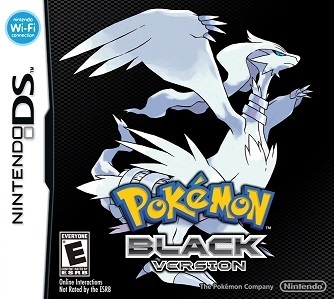 Black is also the first Pokemon game that really felt like a RPG to me, and I�m still not sure it�s a good thing or not.There is a lot of scripted scenes and a few battles that require certain things from you, as well you don�t get to chose what to do or who to name quite as often as you may like. And while this may be fine or even better for most, for me there seems to be a loss of feeling I use to have as a kid. I think the reason I loved Pokemon so much when I was little was because you get to chose who you want and you decided ultimately how things will play out, you train, and you work hard to achieve your own goals. But with Black there were a few times I felt very forced to do something Gamefreak wanted me to do and frankly it turned me off this game every now and then. It wasn�t enough to make me quit, but enough to put me in a bad mood. I think that�s my major complaint about this game, and I think that is why I don�t like it nearly as much as the older generations. And by no means is this game actually worst, rather its just different from what got me into this series. I don�t despite it, and in fact I liked to see something more when B/W 2 comes out, because this maybe what Pokemon needs to get better than it already is and that�s what I want. Conclusion: Pokemon Black improves so many small things that in the grand scale of things, Pokemon has never been better, but there also seems to be something lost in transition from old to new. Black most certainly is a different Pokemon then from what I�m used to, and although I don�t like some changes to the series, overall it�s a good transformation, and I hope to see more of it.